The 2640 Attenuator can be used to help match unequal impedances. It utilizes a high pass filter to avoid impact on the voice band. 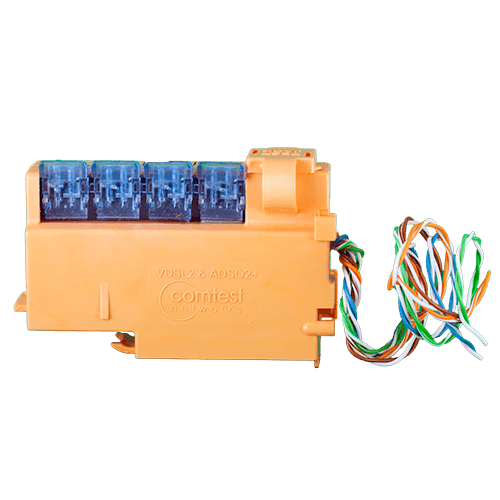 • For 2.5 dB attenuator connect Blue –White/Blue twisted pair to the DSL port of the splitter. Connect twisted pair from Modem to IDC connector marked with 2.5 dB on the SA-2640 plastic housing. All other wires and IDC connectors are not connected. 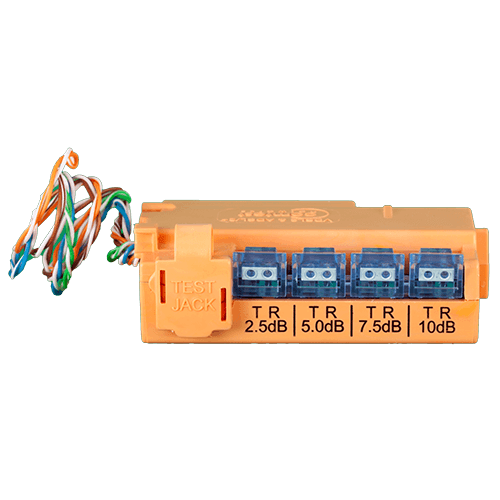 • For 5 dB attenuator connect Orange –White/Orange twisted pair to the DSL port of the splitter. Connect twisted pair from Modem to IDC connector marked with 5 dB on the SA-2640 plastic housing. All other wires and IDC connectors are not connected. • For 7.5 dB attenuator connect Green –White/Green twisted pair to the DSL port of the splitter. Connect twisted pair from Modem to IDC connector marked with 7.5 dB on the SA-2640 plastic housing. All other wires and IDC connectors are not connected. • For 10 dB attenuator connect Brown –White/Brown twisted pair to the DSL port of the splitter. Connect twisted pair from Modem to IDC connector marked with 10 dB on the SA-2640 plastic housing. All other wires and IDC connectors are not connected.